Rose Wine There are 3 products to choose from. Takeaway Lanzarote - Restaurants Playa Blanca Rose Wine Add drinks to your order ! 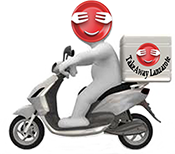 Takeaway Lanzarote -Delivery Service - 24 hours !Order high-quality takeaway online from top restaurants in Playa Blanca, fast delivery straight to your home or office .Get amazing food from an incredible selection of local restaurants . Takeaway Lanzarote - Restaurants Playa Blanca Tasting Notes: Mateus Rosé, the most famous rosé in the world! This wine is light, fresh, young and slightly 'pétillant'. Its quality, extreme versatility and consistent style make it the ideal wine to accompany the good times of life.